InPulse is an ongoing project undertaken in 2015 by Rubis Mécénat in partnership with Rubis Energy Jamaica at the heart of the Dunoon Park community in East Kingston, Jamaica. It strives to support Jamaican youth and improve the conditions of young adults from local communities through the practice of visual arts as a positive means of expression. A creative platform and a life skills development programme, InPulse offers visual art courses led by local and international artists as well as general-purpose educational training. 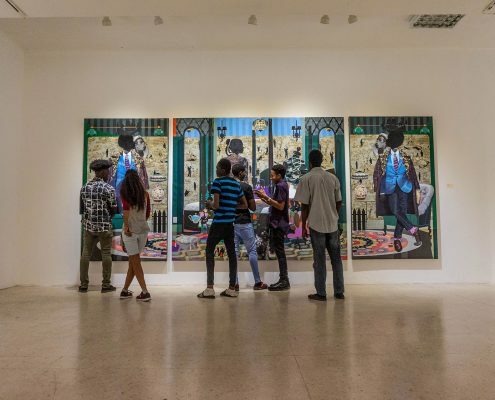 Furthermore, the programme introduces its participants to the art market and to its professionals by organising specific visits and inviting leading figures of the Caribbean artistic scene. Each year the project awards scholarships to the most promising students to pursue a tertiary education at the Edna Manley College of the Visual and Performing Arts in Kingston. The project is led by Camille Chedda, Jamaican visual artist and InPulse Project Manager since 2016. Within the context of its support to contemporary art, Rubis Mécénat aims to develop lasting social art initiatives with the Group’s subsidiaries as a way of getting involved in the local communities and positioning itself as a social and cultural player in addition to the economic role the company plays within the countries. After an initial socio-cultural project launched in South Africa in 2012, the fund launched a partnership with the Group’s Jamaican subsidiary, Rubis Energy Jamaica, to develop a long-term initiative within the Dunoon Park community in East Kingston, near the subsidiary’s headquarters. Jamaica has a dynamic cultural and artistic scene, but it is also a country where local communities are faced with daily violence linked to criminal gangs and drugs. With a youth unemployment rate of nearly 25%, young people living in Kingston’s inner communities are more inclined to drop out of school. This violence is a threat to the young Jamaican generation. It is in the middle of one of these Kingston communities that Rubis Mécénat and Rubis Energy Jamaica chose to set up the InPulse programme with the goal of empowering Jamaican youth through the practice of visual arts as well as to improve the environment and the lives of these youths. Rubis Mécénat’s commitment creates strong links of solidarity and trust. By going as close as possible towards those that are the furthest away from contemporary art, Rubis Mécénat reaffirms its belief in its educational and societal virtues. It does not only reach out to students, it also encourages the local community to become actively involved in visual arts.